Back at the Mobile World Congress (MWC) in February, LG announced several new devices, among them was their first Quad Core Smartphone, the LG Optimus 4X HD. The device uses NVIDIA’s new 4-PLUS-1™ Quad-Core mobile processor. The 4-PLUS-1™ design has 4 cores dedicated to provide amazing performance, and then a fifth core designed to provide better power efficiency while the phone is in standby or doing more menial tasks. 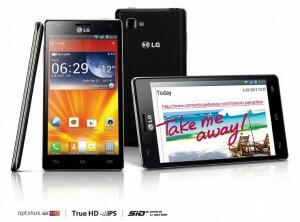 LG has today revealed that the LG Optimus 4X HD will be available next month in key markets, starting in Western Europe. There are still no details on what countries in Europe that will be getting the device first, but since June is not far away, more details is sure to come as the summer month is closing in. Apart from it’s NVIDIA 4-PLUS-1™ Tegra 3 processor, the Optimus 4X HD comes with an high resolution 4.7-inch True HD IPS display, removable 2,150mAh battery that utilizes advanced SiO+ technology, 8.0MP BSI Sensor camera and of course Android 4.0 Ice Cream Sandwich. Some of the new UX features in the Optimus 4X HD is called Quick MemoTM, which first appeared on the LG Optimus Vu. On the LG Optimus 4X HD, Quick MemoTM is integrated into the operating system so that it can be activated within any application, including games or video players. The feature lets you write down memos or notes over a screen image for saving or sharing with others at a later time, or directly in a game if you so desire. • Thumbnail List Play which enables users to view thumbnails of videos playing while watching another video full screen.